SCHERERVILLE | “Take four steps and turn around and come toward me,” said Jen Ryman, general manager of Fleet Feet in Schererville. Ryman was fitting a teenage girl into a new pair of running shoes, so she could not only train for an upcoming 5K, but also start adulthood on the right foot. 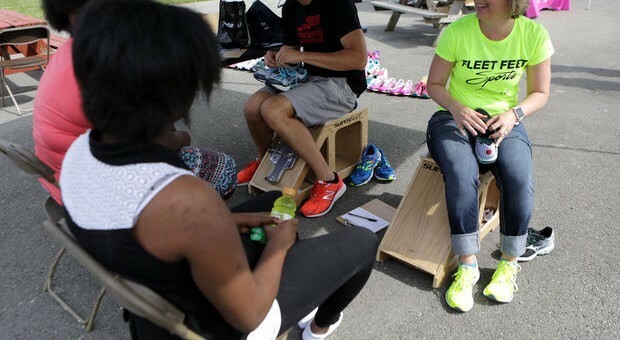 Earlier this week, the sporting goods store was providing free shoes, socks and sports bras for girls from Campagna Academy, an inpatient psychiatric facility for youth, so they could participate in Girls on the Run of Northwest Indiana, a program that teaches girls life skills through fitness. Girls on the Run is at about 80 sites in Northwest Indiana, but this is its first time working with Campagna. Three teams from the academy, each consisting of about a dozen girls who range in age from 11 to 18, will take part in Girls on the Run’s Heart & Sole program, which is specifically designed for middle school-age students. It teaches team-building, problem-solving, and self-care, among other skills. “We’re looking at the girl wheel, which is brain, body, heart, social and spirit, so really the complete girl,” said Jodi Aurand, program director for Girls on the Run of Northwest Indiana. The program starts Aug. 24 and ends with a celebratory 5K, which takes place Nov. 1 at Hammond’s Wolf Lake. “We use running to deliver this curriculum and to deliver these messages and to really empower these girls,” said Jill Schlueter-Kim, executive director of Girls on the Run of Northwest Indiana. “One of the great things about training for a 5K is you really set a goal, you work at it really hard for 10 weeks and gradually work your way toward that goal. And for a woman to stay consistent with running, it’s important that she have a bra and shoes that fit, Ryman said.